QUESTION: Mr. Armstrong, I’m a long time reader and great admirer of your efforts. I recently read an analysts opinion on inflation that I want to share with you. This analyst maintains that the Fed’s actions to stimulate the economy has done nothing more than fill the pockets of the very bankers that caused the economic troubles in the form of excess reserves sitting at the Fed collecting 0.25%. Once the economy gathers enough steam to make lending more profitable for the bankers, he thinks the release of those reserves, in excess of 3.5 trillion to date, will create unbridled bidding for goods and services driving prices higher, thus he wants to buy gold! I don’t, but he does and I’m sure others will follow. What I want to know is how you see those trillions of dollars effecting the economy as it comes online? ANSWER: Sorry, just nonsense. The dollar is really the de facto currency of the world aside from the fact that it is also the reserve currency. As political unrest continues to rise, capital will flee to the US pushing the dollar even higher. This nonsense about hyperinflation and inflation is getting really old. The lowest rate of hyperinflation among the top 10 incidents is about 400% per month and the worse was Hungary in 1946 that reached over 13 quadrillion % per month. These people who keep touting well this time inflation will soar so buy gold, have zero historical perspective and if you want to cite the hyperinflations in history, ALL tangible assets rose from art to real estate. 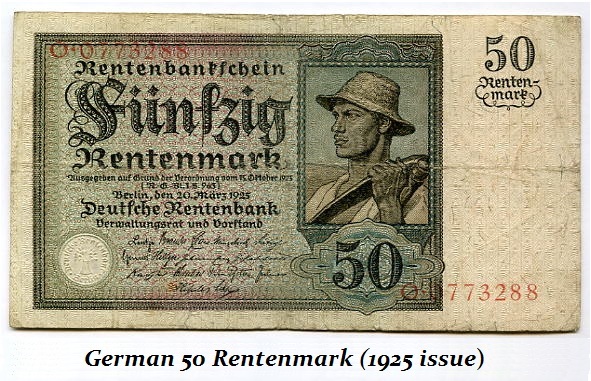 In fact, the currency that replaced the inflated mark in Germany was backed by real estate in 1925. So quite frankly, if you are talking about inflation and gold’s pretend special hedge against inflation, I honestly do not know what drugs these people are taking. There is ABSOLUTELY NO incident in history where gold has EVER provided such a hedge in any sole capacity – NONE WHATSOEVER!!! When a currency goes into hyperinflation, there is no coming out of it. Thus, ALL tangible assets become the hedge – not just gold. I have stated countless times that gold is the HEDGE AGAINST GOVERNMENT, not the hedge against inflation. It has risen during such periods ONLY when there is uncertainty as to what currency will survive. Claiming that the $3.5 trillion will rush out and cause ONLY gold to rise is absurd. The vast majority of such money will flock to shares and real estate as it always has. YES they traded stocks in Rome as well and the idea of a corporation comes from Rome. In the US, $3.5 trillion is just about 20% of the outstanding federal bonds. Add in all the other debt, shares, and real estate, and we are less than 2%. Add in the world, and forget it. It would be like putting a drop of oil in the ocean. Gold is going to rise WHEN capital realizes that we have a geopolitical problem and there is uncertainly on the horizon as to what monetary system emerges afterwards. This is the real issue – not inflation. Plain and simple, gold reach $875 in 1980 and the Dow 1,000. The Dow has reached almost 17,000 and gold at its peak below $2,000. From a plain numbers game, the Dow was a far better hedge against “inflation” than gold since 1980. Why these people keep saying the same thing over an over again and somehow expecting a different result (this time I will be right) is a mystery. This is about surviving – not promoting some scheme or sick distortion of history. Why keep preaching the same thing costing people their future with no remorse is irresponsible. That is not an analyst – it is a promoter. It is equally important to understand WHY you lost money as it is when you make it. If you do not understand how things truly function, then your wins will be sheer luck and the losses will become fate. « Assassination – tool of Revolution – The Contagion of the 19th Century – Are We in for a New Contagion?